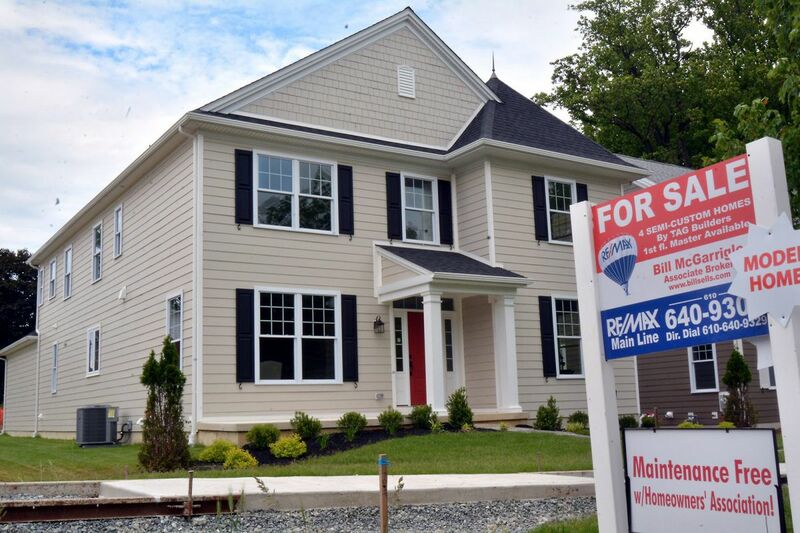 A new home for sale along South Warren Avenue and 2nd Street in Malvern in May. As building costs in cities continues to be an issue, economists predict that suburban sprawl will emerge again in 2018. 2017 — and the craziness that has come with it — may not be over yet, but economists are already looking toward to the start of 2018. A new year will not necessarily bring a new housing market, the economists predict, as many of the problems that plagued the market in 2017 — namely, the inventory shortage — continue. Still, some big changes could be afoot. As the number of homes listed for sale will remain in short supply next year, homeowners will choose to remodel instead of sell, worsening the inventory crisis, economists at Zillow predict. And with so much pent-up demand brewing, builders will take notice: Finally, according to the predictions, they will begin building the elusive entry-level home again. To do that, and to actually make money doing so, builders will have to return to a familiar strategy, Zillow said: suburban sprawl. In an era in which cities are having their moment in the spotlight, the sudden suburban reversal may seem shocking. After all, as urban areas have continued to see an influx of better dining, entertainment, and housing options, younger and wealthier residents have poured into cities, boosting housing demand and raising prices. That's exactly why the suburbs will soon have their moment, observers say. "There is just less land available to build on" in cities, said Skylar Olsen, a senior economist at Zillow. "The land available is farther out, where you tend to run up less against NIMBYism [an acronym for the phrase 'Not in My Back Yard'] and challenges to development." Across the United States and in Philadelphia, the cost to build in urban areas has become a problem, according to experts — and not just because of the often lengthy and expensive approvals processes that many developers face. Land costs are rising, and developers in many cities have still not been able to fetch high enough rent or condo prices to offset that expense. Meanwhile, construction costs — particularly labor — remain expensive, as workers have not returned to the industry after leaving during the recession. "In a city that's becoming less affordable, construction labor cannot afford to live nearby," Olsen said. "I have heard from a lot of developers who cannot get projects to [work] because labor contractors are willing to take a little bit less in pay in areas where they do not have to drive two hours to get there." The expected suburban switch, however, will be driven by more than economics. It is true that land costs are typically cheaper in the suburbs and that developers usually face less resistance from township planners. But the predicted suburban growth will likely also be pushed by demographics, Olsen said. Already, Zillow has found, millennials are rebuffing the unflattering stereotypes placed on them years ago. Rather than holing up in their parents' basements, millennials are embracing living habits that largely resemble those of their parents. Nearly half of millennials — now between the ages of 20 and 37 — live in suburbs, compared with a quarter of their generation that live in cities, according to Zillow. Still, home buying will remain a challenge for them in 2018 — suggesting that urban popularity will not collapse anytime soon. Often burdened by student debt and sluggish wage growth, millennials have delayed homeownership in ways that generations before them have not. And the dearth of entry-level homes has not made homeownership any easier. The extent to which developers will actually begin building starter homes remains a large question. Profit margins are slimmer for entry-level homes, and building often makes sense for developers only if they are in high demand, observers say. And although millennials may be ready for homeownership, the success of more starter homes will likely hinge on whether first-time buyers can actually afford to buy. According to Zillow's 2018 predictions, the housing market is expected to continue to grow in 2018, though at a slower rate. Home prices will rise 4.1 percent, Zillow predicted, based on more than 100 housing experts and economists surveyed, a slowdown from the current 6.9 percent price appreciation that homes nationwide saw this year. The growth is not necessarily indicative of a dangerous bubble, the economists say. Compared with a decade ago, when predatory lending practices dominated the industry, the "fundamentals" are much stronger now, according to observers. What that means: Jobs nationwide are growing, demand remains strong, and interest rates are low. As a result, the growth in the housing market is less artificial than it was a decade ago. At a conference in California earlier this month, Lawrence Yun, chief economist for the National Association of Realtors, also downplayed fears of a high-risk bubble. "Prices will not fall in the Bay Area," he said, while speaking in Santa Clara County. "As long as they're creating jobs, there's really no reason why" the bubble — or what is starting to look like a bubble — will burst.